The quiet solitude here is very good for my creativity. I sang to Mother Earth tonight, as She was embodied in an eagle. It was completely magical! Yesterday was more beautiful than I could have imagined: at Paul Lake, close to Kamloops BC, my hometown, we had come to rest, and find our way forward. A quiet walk along the water’s edge; found a stick shelter, crafted by scouts perhaps, up against a big rock on the mountainside. Took time to offer our minds and hearts – I was inspired and enfolded into the beauty. I breathed, and shimmied with the energies flowing through me. Later, left alone with the beauty, I said a prayer and felt the power of it. It will go with me – it holds power for others too. I will share it… but not now. Now is to remember tonight – we went out again. Stood in the midst of green. We drank in the silence, accentuated by small nature sounds, sharing a smoke; and worked hard to see where the squirrels were that chirped and chattered at us, just like they did earlier… It’s springtime though, and it wasn’t us they were interested in – I don’t think they noticed us at all! We watched their racings through the 3D maze of the branches of the trees, and laughed at their antics. 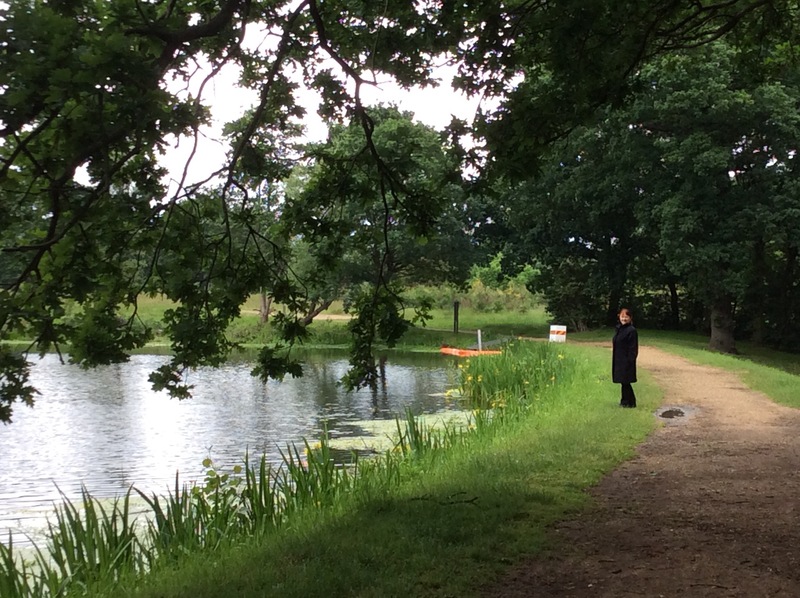 Peace, punctuated with natural accents, is so powerful… As we gazed, I pointed out a snag on the other side of the bulrush-choked pond – its colours were brilliant yellow, red, orange, brown and black. We watched as a big bird came into sight, and it seemed Spirit wanted to help JJ see which tree, as it flew to the top of the very one I was trying to point out. We couldn’t figure out what kind of bird it was; its movements were very like a seagull. Then JJ got cold and we turned to go in but then JJ turned back to me and said, “if you want to walk slow and take your time, I’ll go ahead. Just be back before dark or I’ll have to come and find you!” I didn’t have to ask; I felt very loved, supported, and understood. Pacing my way ‘round the last time, not knowing exactly where I started, not knowing… but guessing, going with it; I stopped and raised my eyes – and they walked up the length of the very same dead tree, with the bird standing on top looking at me from far across the slough. I was in awe; I bowed deeply to the eagle, turned and mounted the stump, stepping carefully. I hugged my wrap around me and stood, breathed… already the memory is fading; the magic hiding itself… why does it do that? I remember “calling in” the four directions, and being deep in inspiration (I saw the west as orange, like a sunset. But then I also said blue, as is customary.) I remember the bird was a focus for me as he frequently moved about, making his short flights, preening and stretching his wings. It was during one of these stretches that I saw the colour scheme of his underside and was finally convinced that he really was an eagle, and I felt honoured. I also remember singing my mantra, “Great Mother, My Lover,” trying different ways of using my voice. When the last notes of my song drifted away, and I opened my eyes, I saw the eagle sitting looking at me. He had heard and seen the entire thing. He spread his wings and flung himself from his tree. I felt like it was a standing ovation from Mother Earth. Walking with Drew and Denise for the first time through the park across from the Synergy Hub/Antonius here in Rotterdam. Merlose and I were talking about how beautiful it was, out there in the sunshine with a boy and his mom. She shared with me that going to the park had not been a peaceful prospect when she was a child. That this could be a pleasurable experience was new for her and she was doing great until she started remembering how bad it had been. Have you done that? By remembering a feeling you felt in the past, you can bring it on again, can’t you? We cracked up! Merlose is the creator/author of a comic-book loosely based on the life of Terence McKenna, one of the most vocal supporters of the use of psychedelic mushrooms ever. That Drew would be given THAT game and say it at THAT time was very synchronistic, like Spirit giving her a poke and a smile, telling her to relax, everything is ok. We were just winding down when Merlose noticed something on the phone’s screen and she asked, “What’s the name of the game?” Drew took another look, “Oh, I was wrong. It’s Marshmallow Land,” and we were off in gales of laughter once more. We refer to that kind of synchronicity as a “Jungian slip” (the ‘Freudian slip’ is usually sexual in nature). It was wonderful that he had seen something meaningful to us, rather than what was “really” there, and we had been ejected explosively from the blues. I believe there is a reason for everything, even though we often can’t see it. The threads of our lives are woven together by Greater Hands than ours, and when we put our faith and trust in that weaving, our lives become magical. Capable as we are, there is so much more possible than what we can wrap our little heads around; Spirit is guiding us forward, towards a bright unimaginable future. Do you feel a little thrill of anticipation, thinking about that? That’s the feeling we need to remember when things get crazy/scary, or even just challenging. We talked before about “remembering a feeling can bring it on again”… This is how you can transform a difficult tendency of the mind into an effective tool for staying on the upside of life: remembering the good times can seed the now moment with prime material for creation of more good feelings. I found this unpublished so must finish and post it – there’s so much that has happened! 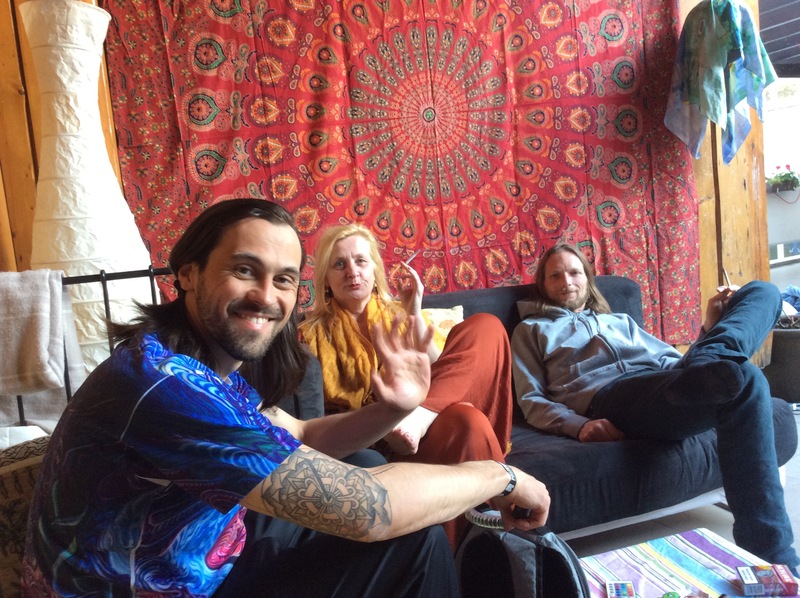 Nico is now here with us in Rotterdam; his former flat-mates now share with a couple who are special to them. This is what I wrote back in May, on my first real holiday from the work I’ve taken on here in Rotterdam. Great BBQ at Nico’s place on Mothers Day; a highlight of my visit to Dortmund, Germany. We must have had 30 people in circle here on the patio! Sunday afternoon, on the sunny patio once again, this time we have street music blaring from a block away. It’s Mothers Day. Hi Nico, Vera and Gregore! Thanks for a great time! Here is a view of some of the rest of the patio! Tomorrow Nico and I will be driving back to Rotterdam (stopping to visit his parents on the way to give his mom a hug for Mothers Day) and will check on the Ether mining rigs at Chefaro. I know that probably sounds like Greek to you… (or Dutch!) Ethers are a new kind of resource ‘mined’ by computers, and Chefaro is one of the buildings of The Meesteren Foundation, the same group that has provided space to United Earth for our Head Office. We are in this together, as is Noomap; and others are joining – perhaps some from the Kamin Philosophen group that Nico has invited in for me to meet. The circle created itself, there on the balcony, and I told them about United Earth and about the new building that we will be moving into, courtesy of Meesteren. I extended an invitation to come see and consider the possibilities. I spoke, and then we called a break before questions. Leaving the circle, I was caught in conversation by another elder and it was such a pleasure and so interesting that I lost track of time. Everyone was so respectful they didn’t interrupt and I lost track of time – the momentum of the circle was broken and I didn’t get a chance to eat. The limits of our endurance is one of the on-going lessons we each have the opportunity and privilege to learn as we go through life in these vessels, our bodies. When our circle reformed I was unable to continue so lost the opportunity to answer any of their questions. I hope they come to Rotterdam so they can see for themselves! Nico is now here with us… September is a long time from May, and a lot has changed – but not my appreciation of the lovely time I spent in Dortmund! Thank you!! We have a family tradition enacted every month. On the first of the month, the first person who says “rabbits” to someone else, and it’s the first thing they say, they get good luck all month. Mom got me this month, by email. A bit of a stretch of the rules but what’s a rule or two within family? This is what I wrote back to her. Oh my… well, that didn’t work, did it!??! My attention was elsewhere so you got all the rabbits and the luck this month. Darn. I could have used it. I only had so much money (seems it’s a powerful tool for Spirit to guide us, as necessary!) so I was determined to purchase only what inspired me. I kept telling myself to just enjoy watching a truly beautiful skirt being worn because I’m traveling and I’ve got enough clothes. So I wasn’t worried about saving up for clothes when I got stopped by a stall selling crystals. It was nighttime and they had the lights on and they all sparkled so pretty. You know what I’m like with sparkles! They had red dragons… that’s my Mayan Signature: Resonant Red Dragon (means I’m connected to Spirit – surprise, surprise!) but none of them was MY dragon. Then a crystal was brought out that caught my attention, and kept it, and so I bought it. Then I bought another one, and I’ve already used it in my work! Well, first I had to come down to earth rather hard. I found I had messed up – I was late for the second workshop I was scheduled to give because I was trying on my skirt. (My first workshop was Guidance and Tarot. It was great!) And Karin had arrived to pack up the tent. It was lovely to escape and take a few minutes to start doing the workshop anyway–it’s always nice to do Qigong! I wasn’t far into it when Yoka interrupted me saying, “I know you’re doing qigong but I’m going to interrupt you,” and she put a diadem on my forehead, sectioning and pulling my long hair up through the cord and laying it down flat again. She bent the metal here and there, and told me to work on making it lay flat against my skin. She said it was from her private collection and it was a gift – it was a moonstone. She asked me to come visit her and I need to think of how I can do so. She’s special. When we had packed up the tent and all our finery and treasures, she pointed out a bunch of clothing that had been left free-for-the-taking. A jacket had caught my eye earlier but it looked small… It’s a bit tight but I can wear it and I love it… it is a short vintage houndstooth pinchwaist with a silk rose at the top of a ^ inset in the back. I’ll have to take a picture because the whole outfit is outrageously beautiful, with my long silver hair, silver bracelets and moonstone at my throat, forehead and finger (thank-you, Mom!) I look like a gypsy! I have a crystal ball! I now look the part and I’m drawing cards for others again. I was honoured as an Elder and Grandmother, and got to tell some of my stories to many people. I walked in the woods and laughed and sang with an Indigenous Grandmother and healer, Carola Esparza. (oh, Carola, it was magical!) I feel like Spirit’s hands were in it “up to the elbows”! It all happened without intent, and by making choices in the moment from an attitude of gratitude and self-worth. So many things have happened since I came to Holland – because I was guided to… I trusted the guidance and took the step. And now I’m going to close because it has been days since the end of Lorelei and I really have to post this! Bless you, and all of you… May you walk in beauty in your every day – and notice it more often! The remaining water was set aside to be used in the closing ceremony of the Festival. That was hard… the saying goodbye part, I mean. So many of these women have become special to me and the memories are still so new that I cling to their freshness, savouring the qualities of each one. A tear, a smile, a laugh, a turn of phrase, a graceful gesture, women walking away and women walking towards me with beauty and love sparkling all over their faces. I broke an arrow with my throat and walked on fire. I listened to a Dutch workshop on ritual and magic and understood much of it – thanks greatly to the young woman who translated for me. The Dutch people have been very gracious; I get the feeling though that they’d just as soon I don’t try learning their language because they keep telling me how hard it is! I need encouragement and fun to learn this stuff! After days of such hot weather that we melted even in the shade, the rain that night was almost welcome (though it never is when you’re in a tent!) We laughed and wondered if we might have caused it with the water ceremony the night before. I’ve talked a lot about my experience… What do you think? Were you there? Have you walked on fire? An oasis of peace in the centre of London’s East End, Annette’s house is the epitome of an English artist’s home, stocked to bursting with beautiful things, reminders of inspirations and hard work. I was lucky to see her most recent work, a tribute to pigeons and gulls in The Tidal House, a reclaimed derelict mill, once powered by the tides, now a museum and film location. When we dropped in there was a party going on, an English form of wine and cheese (gin and nibbles!) with live jazz, a real-life crowd-funding for convicts or something. Her origami pigeons, flocks of gulls and great falls of beautiful handmade and painted paper were a brilliant accent to the ancient dark wood and girders. Gave all the dressed-up ladies and gents an extra something special to contemplate as they made out their cheques! 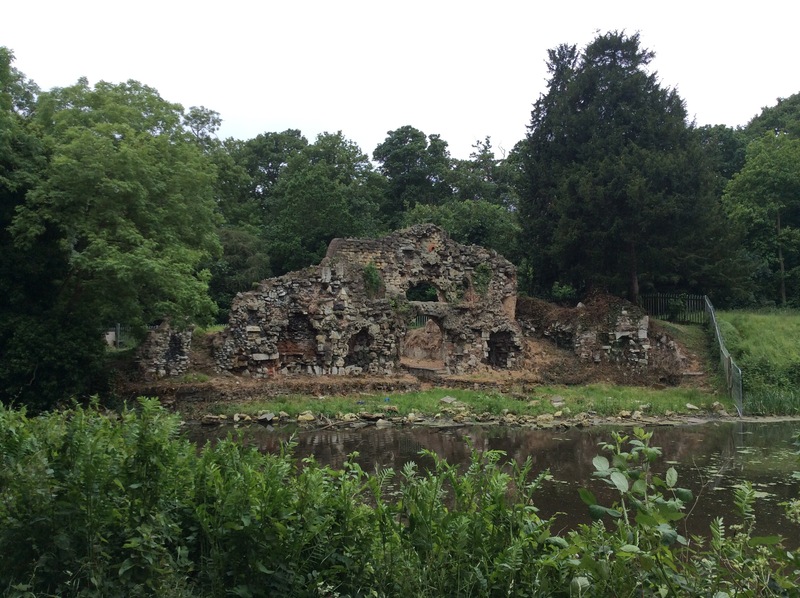 My next experience of Annette’s London was Wanstead Park, an expansive wildish acreage once held by an heiress and her spendthrift husband. There are ruins of a grotto (see picture) where he locked her up when she wouldn’t give him anymore money. But there came a day when there just wasn’t anymore and they lost the place – no more was she captive in the rock-work house set into the hillside beside a small lake, part of a network of waterways. The canals and lakes are home to many birds including coots, mallards, cormorants, swans and robins (different from North American ones) and the ever-present sparrows singing their hearts out. Birdsong was so much more present in London than I’m used to – made me feel confident that, when we bring trees back into other cities, songbirds will come back too. Annette’s London also includes a jewel of a theatre where we saw Love N Stuff, a stage play of acting genius wherein 2 actors created a comedy of epic proportions that made the large stage seem crowded! The only sound heard in the theatre, other than the actors many-accented lines, was laughter. 90 minutes of that was a great workout for the belly and facial muscles! A day walking along the Thames from The Tower of London through to Trafalgar Square was a workout too! It was perfect until, just after taking pictures of the man creating floods of beautiful bubbles to the delight of the children (and all others too! ), Annette’s camera was misplaced and all the pictures she had taken were lost too. Though she has my pictures, they aren’t the same and she’s out a camera, a must for an “indigo” artist of her caliber and experience. She shared some of her films with me last night and I’ve been appreciating the many forms of pottery and artistry cached in her small home, catching my eye every time I turned around. Extremely lucky today, too! Apparently, the British banks do not recognize my bank card. We found a way at her bank; with the help of Visor Johal (I’m not sure of his name, but that’s close!) we were able to put some money in my pocket. Thank you, Annette, for all your help! I’m on the train now, on the way to Hartlepool, on the northeast coast of England, to meet up with Bret and Tan who are in Skelton, a few k away. Seeing where Tan grew up and meeting the family, especially Gracie, her niece, is anticipated with great pleasure. I hope the weather cooperates as well as it has so far…!